Christine Faber (Lynn Bari) doubts her own sanity after hearing the voice of her dead husband calling to her from the sea (why the doubt, this is common, isn't it?). 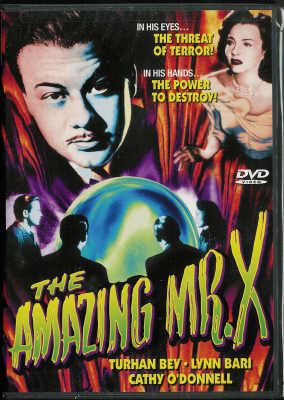 Against the wishes of her new fianc�Martin (Richard Carlson, of The Creature From the Black Lagoon and It Came From Outer Space - both available at MyMovieMonsters.com), she begins to see a mysterious man known only as Alexis (Turhan Bey) who claims to be able to make psychic contact with spirits from beyond (known today as "crossing over"). Although Alexis continually provides accurate information known only to Christine and her late husband, she begins to suspect him of being a fraud (no kiddin'?). Expressive use of shadows and light add to the macabre sense of nightmare in this masterful chiller!